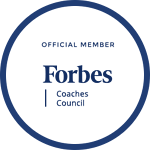 Flawless Inbound can help you craft and perfect an inbound marketing strategy for your business. Contact us to get started or have your questions answered. Wordsmithing itself is only going to get you halfway there when it comes to chat bots. It’s important to know how your chat bot fits into your brand storytelling, but beyond that, people expect a particular experience from these nifty new tools. Fail to provide that, your customer going to feel unheard and uncared for — and those are the whole reasons you want a chat bot in the first place! 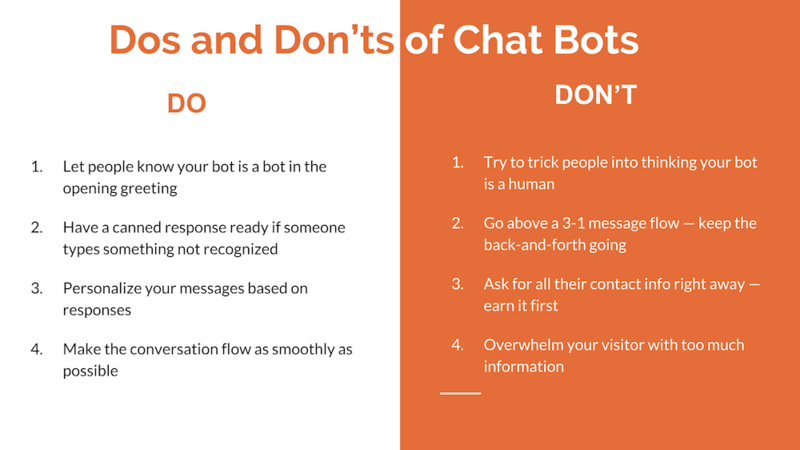 Luckily, sticking to this quick list of Dos and Don’ts will go a long way in providing a pleasant and effective experience for your chat bot’s conversant. Get things started by immediately clarifying that they are indeed talking to a chatbot and not a real human. This will set expectations and allow the user to engage with the bot without getting confused or annoyed when it can’t answer general queries. First off, you can’t trick people into thinking your bot is a human. Don’t even try. If you do try, you will fail to trick people into thinking your bot is a human, and those people won’t be happy that you tried. Trust your customer. Don’t lie to them. Even when they do know they’re talking to a bot, users might overestimate its intelligence and try to ask complex questions you haven’t accounted for. A quick “I’m sorry, but I don’t understand that yet,” can help move the user forward and hint that they should stick to the obvious options. Generally, conversations involve the participants taking turns. Take too many, and your bot will appear too pushy. It will no longer feel like a conversation, and the user will be less likely to want to continue it. Take your time and keep the back-and-forth interaction going. People love personalization. It helps them feel as though they’re being heard. Ask for their name early on and then drop it back in every so often. Take information you grab, such as job role, and deliver different messages and content based on it. Avoid having a single, linear path and explore how your chat bot can create a personalized experience. You’re trying to reduce the intimidation factor a form has. Ask for contact information before you’ve earned it and you’ll scare people away. 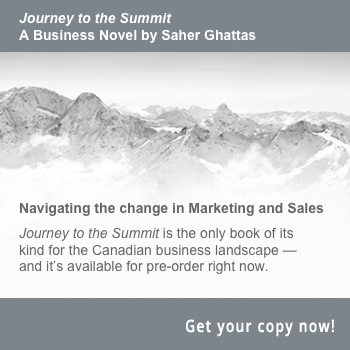 Hold off on requesting anything you don’t expressly need until it’s relevant to ask. When they’ve indicated they want something emailed to them, you can ask for their email address — just hold off until your bot gets to know them. Every message should lead into the next and read naturally following a user’s response. Don’t dart around topics unless you’ve arrived at an organic transition point. And as you build branch after branch and your messages might have multiple paths to and from them, ensure they match up with every possibility. 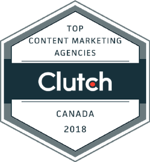 Yes, you’ve got some great content and you might be tempted to send as much of it as possible to the reader. But as with a good message/response ratio, you don’t want to overdo it. Stick to completing one goal at a time — and try not to send enormous messages that require your reader scroll back up. Enough Talk — Get Building! Not enough? Check out last week’s post on what chat bots can do here. Need a hand with your chat bot strategy? How about integrating your chat bot strategy with the rest of your marketing plan? 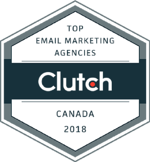 Flawless Inbound is a leader in the modern marketing space, helping more than 60 organizations across Canada and the US achieve growth and success. If you’d like to learn more, reach out and let's chat! 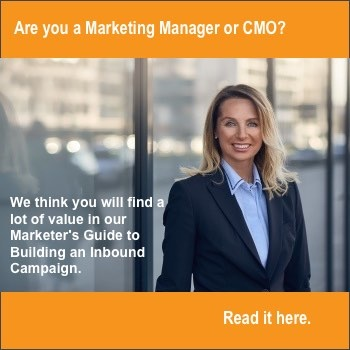 You can also get more information for Marketing Managers here. 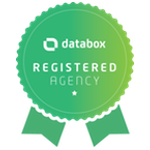 We are an Inbound Growth Agency focused on B2B organizations. 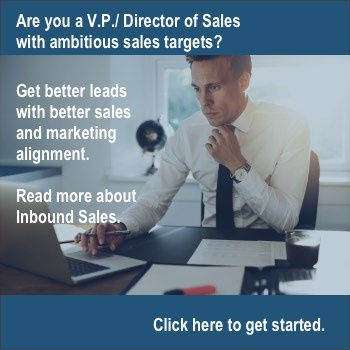 We are unique in our approach because we go deeper into your marketing strategy and your sales process end to end. 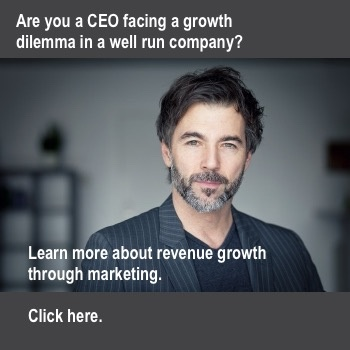 We will help you set revenue goals, increase traffic, and generate qualified leads.